7.29 points at 14 votes (rank 265). Mervyn, a sorcerer's apprentice was in one of his practice hours with his mentors. He was about to try a new spell for a better look, but this failed and turned him into a frog. While being in this state, evil warlocks appeared and killed all his mentors. He alone was saved, as he appeared only to be a frog. Now Mervyn is the only one left to take revenge on his attackers, by destroying all the warlocks. 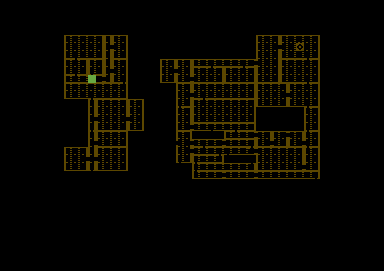 So he heads off into the dungeons of the warlocks, consisting of 8 levels. He hasn’t lost his magic abilities and can use them to defeat the minions of the warlocks. The warlocks themselves need to be defeated in single fights, by putting together the word "RANARAMA", before his life energy is drained. Mervyn can still do magic and possesses spells on a low level, which he can raise during the game. Equipped with this, he dares to go into the dungeons of the attackers – but for this he needs energy, which he uses up but which he can also refill. 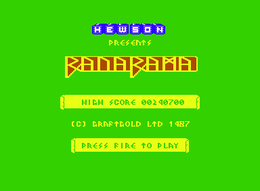 The game RANARAMA reminds a bit of Paradroid (fights with warlocks, lifts, darkening of the level when all warlocks are defeated), but has also Gauntlet elements (exploring the map, nests with monsters). There is no scrolling, but the single screens build themselves up during the game and can be entered again and again. New rooms appear fluently. Unfortunately, some enemies cannot be defined clearly, as they are only shown in black (in the original spectrum version they are coloured). Therefore it might happen that you cannot see in all the confusion, how many enemies you are facing. The screen is well-arranged in the playing mode. Except for the main happening you can only see the energy bar. Points and facts about the currently used spells are stored in a separately available screen. One can also concentrate well on the “fight” as this is showed in a separate screen as soon as the player meets a warlock. A fast melody is played in the title screen, while during the game appropriate sound effects for jumping, shooting, spells and during the fight are played. When a level is finished, the minions that are left, patterns and symbols are displayed in black. Mervyn is then displayed in bright grey and energy crystals stand out in green. Unfortunately, there is no highscore list in this game. 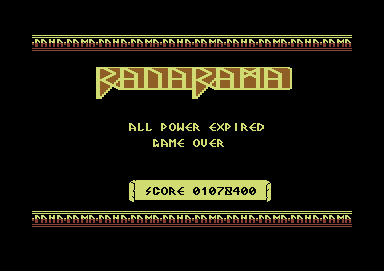 The currently highest score is displayed on the title screen from time to time. Mervyn in a room with a warlock. A level free of all the warlocks gets dark. 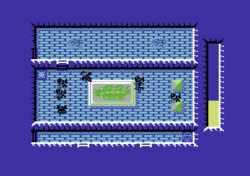 At the start of the game you are placed in the easiest level (blue background) in a randomly chosen room. After that you should explore every room and destroy all minions, monsters and above all the nests. If you meet a warlock, a fight is started. Here you need to puzzle together the word RANARAMA before the energy counter has run out. If you win it, the warlock is defeated and you can pick up the runes. If you lose, you lose your current power spell (or a life). With the collected runes you can cast spells on a higher level. For Mervyn's movements and spells you need energy – the energy that is left is displayed on the right by a yellow bar. If it sinks under a certain level, the frog starts to flash. When the bar is empty the currently used energy spell is used up and the frog explodes. After that you are placed again in a randomly chosen room on the map. To refill the energy, there are energy crystals spread on the map. They are practically drawn towards the frog. Only when you’ve entered a room you see its size and what is in it. From that moment on the room will appear on the overview map. Enemies are only visible when you are in the same room as them. There are altogether 8 levels, whereby the background colours differ (easens the orientation). 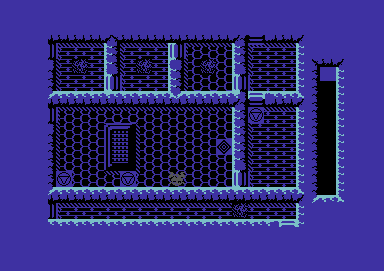 First level in blue – with some minions and nests. The red level – here you will meet other minions. Power Spells – they decide where the magician gets his power from. It is the only spell that can run out. It feeds all other spells – how much they need is shown behind the word "Drain". You lose the current chosen power spell when the energy bar is empty. If the status of the power spell is "Mortal" and all energy is gone, the game will be over. Offence Spells – decides, what weapon is used. Defence Spells – decides, what defence is used. Effect Spells – here you can choose an additional spell, which can be a big help. A good example is the spell "Find", which is there at the beginning. With it you can make the hidden doors appear. There are 8 different spells of each type with different levels. At the beginning you start with the weakest spells. Explanations for each type are given in the menu. You only see spells, which you can afford to cast with the runes you carry. A power spell is used up. Power 1 - Base Magic Mortal Uses your own life energy. When expired you are doomed. Power 2 - Mysticism Psychic Second level energy spell. Uses energy of the mind. Power 3 - Witchcraft Symbyotic Third level energy spell, uses life force of others. Power 4 - Magecraft Electra Fourth level energy spell, uses electromagnetic force. Power 5 - Runecraft Elemental Fifth level energy spell. High power from the elements. Power 6 - Runelore Ley Sixth level energy spell. Syphons power from leylines. Power 7 - High Magic Entropy Seventh level energy spell. High power from time. Power 8 - Sorcery Omnipotence Power supreme, enough for all spells. Offence 1 - Base Magic Lap Better than nothing. Offence 2 - Mysticism Missile Improved firepower. Offence 3 - Witchcraft Plasma Bolt Bane of mortals. Offence 4 - Magecraft Fireball Deadly firepower. Offence 5 - Runecraft Bullball Electric firepower. Offence 6 - Runelore Annihilate Extreme firepower. Offence 7 - High Magic Disintegrate Bane extreme, but uses high power. Offence 8 - Sorcery Vaporise Magic supreme, if you have the power. Defence 1 - Base Magic Protect Standard defence. Defence 2 - Mysticism Shield Reduces hits. Defence 3 - Witchcraft Wall Better defence against physical attack. Defence 4 - Magecraft Barrier Muncher of mortals. Defence 5 - Runecraft Unseen Mortals cannot see you. Defence 6 - Runelore Electrode Defence against Electrocute. Defence 7 - High Magic Firebane Defence against Conflegrate. Defence 8 - Sorcery Charm Defence against black magic. Effect 1 - Base Magic Find Will cause hidden doors to appear. Effect 2 - Mysticism See Displays warlocks on map, if room has been explored. Effect 3 - Witchcraft Jump Transfer through space when in real trouble. Effect 4 - Magecraft Demon Unleashes an ally. Effect 5 - Runecraft Foolsbane Will cause mortals blind panic. Effect 6 - Runelore Electrocute Hits all vulnerable within active room. Effect 7 - High Magic Conflegrate Red peril to all in range. Effect 8 - Sorcery Black Magic Most deadly magic. As you can see, you need different runes for the spells of a higher level as for the ones of a lower level. You will get these runes when defeating warlocks of a higher level. But as many runes are needed for several spells, there will always be a shortage. Glyph of Sorcery View currently used spells and use different spell. The overview shows the status of the drain, available runes and the score. By scrolling you can change the currently used spells (depending on available runes). Glyph of Power Releases a magic bolt of varying intensity. Disappears after use. Glyph of Travel Access to other levels. It may not lead back to where you came from. The map of the level is called up by the eye smybol. Changing the level by the Glyph of Travel. 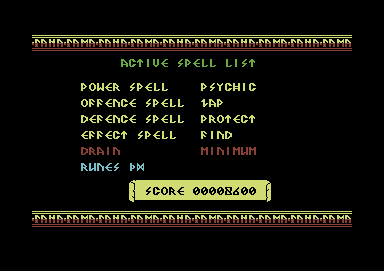 In the spell menu you can scroll through the choice of spells available. A simple fight against a low level warlock. There is no solution as such, as the warlocks are spread randomly and the runes you get are different at every game. First do the simple levels. You will recognize them by looking at the minions. If they are hard to shoot you are not prepared yet. If you are unlucky, you get runes with which alone you cannot cast a spell, but you get lots of them. Read the explanations for the spells carefully – “high level” does not always mean “very useful”. Do not attack a warlock when having low energy. You might win the fight easily, but you would still want to be able to pick up the runes afterwards. Try to enter a fight with a warlock when the room is apart from you two empty. First destroy the nests, so no more monsters can form. Monster from the nests approach you and you absorb them – this uses up a lot of energy, therefore try to shoot them. Effect, attack and defence spells of a higher level need more energy. Only buy these spells if you can provide them with energy. When you’ve won a fight, quickly pick up the four red runes. They often scatter in all corners of the room. The runes disappear after a short time, so hurry! As long as the runes are in the room you cannot shoot! Camailleon: "If you occupy yourself with the game for a while, it is really fun. Although it reminds me a bit of Paradroid, it has further elements which give it its own charme. I could have imagined the minions to be a bit more detailed and coloured. In other respects, this game is really great!". 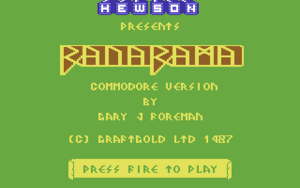 Robotron2084: "First I was thrilled by Ranarama: 'Ah, a fantasy type Paradroid? Great!' I thought. But after some time the defects at play came more and more to the fore – next to the obvious technical inadequateness as slowdowns and mean spectrum graphics. The game can be a long haul, a session can easily last half an hour or longer, of which you spend a good part with jumping through the already empty sections and the huge levels. For me this is just too little action in contrast to the comparable Paradroid. Furthermore, the collision query is rather moody, you often miss the hostile objects although you are standing directly next to them and enemies sneak up on you in the very broad blind angle. If you then lose your energy spell and are reborn as a mortal in a room full of enemies – far away from a Glyph of Sorcery – then you are frankly speaking gone to hell. For me the game was a flash in the pan. 6 out of 10 points." 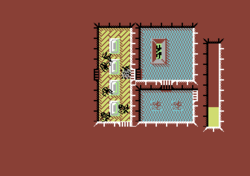 The game was originally developed for the Spectrum. 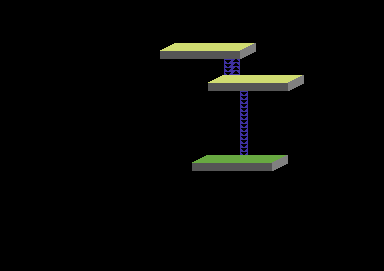 On that platform it is designed more coloured and was very successful. 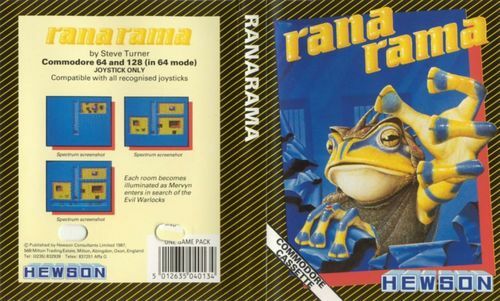 Rana is Latin for "frog", ramus means "branch". There is a remake for Windows, Linux and Mac (s. section Links).